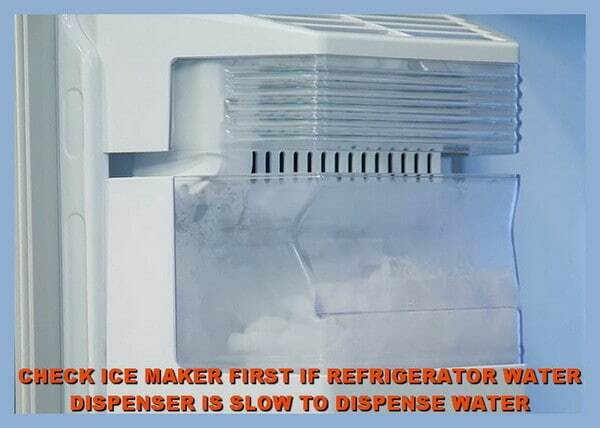 Water dispenser slow? Not enough ice cubes being made? If your refrigerator water dispenser is dispensing water too slow and you have low ice cube production, this could be a few different issues. Water that dispenses from the refrigerator water dispenser too slow may mean a clogged water filter, low water pressure, a crimped water line, or clogged valve. The same goes with low ice cube production. What causes my refrigerator water dispenser to dispense water so slow and not enough ice? 1 – You could have a clogged refrigerator water filter. 2 – You may have low water pressure going to the fridge. 3 – Crimped or kinked water line. 4 – The saddle valve on the back of fridge may be clogged. 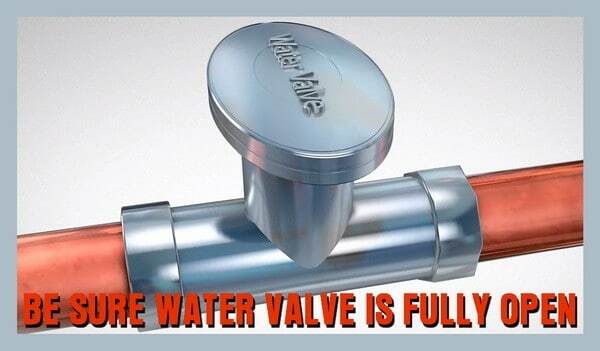 5 – Your water valve that supplies the fridge may not be fully open. To troubleshoot this issue, it is best to check the ice cubes first. See if the ice cube tray is making a full ice load each time it creates ice. If the ice cube tray is not making the proper amount of ice cubes per cycle (half full), the ice cubes are hollow, or the ice cubes have a soft shell, this indicates the water pressure is too low. This may mean the water filter that filters the water to your complete fridge is clogged and needs to be replaced. Even if you replace the water filter every 6 months, it still may be clogged from heavy use or your water supply quality. Replace your water filter, check for kinked water lines behind the refrigerator, be sure all water valves that supply your fridge with water are fully open, and open and close the saddle valve behind your refrigerator (if applicable). If you need a new water filter for your refrigerator, you can find ALL factory approved fridge water filters here. You can buy them in 3 packs to save money. Remember to replace the water filter every 6 months or more depending on the quality of the water in your area. If you need assistance on how to change your filter on your fridge, here is the way to change your refrigerator filter for your LG fridge filters, Samsung fridge filters, Maytag fridge filters, Frigidaire fridge filters, GE fridge filters, Whirlpool fridge filters, and Kenmore fridge filters. Your refrigerator water dispenser can be tested. Use an 8 ounce cup and fill the cup with 8 ounces of water. The water filling process should take from 4 to 8 seconds to fill. If it takes longer than 8 seconds to fill an 8 ounce cup, this indicates low water pressure, a bent or crimped water line, or a clogged valve. 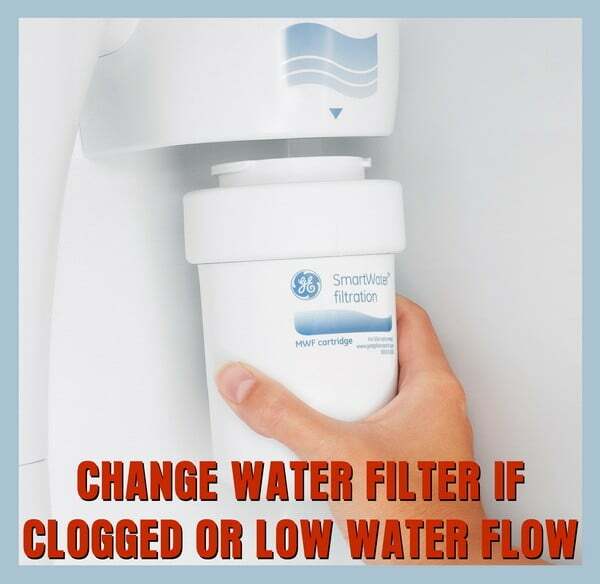 This means that a water filter may be clogged. To resolve this: Replace the water filter, check for crimped water lines behind the fridge, be sure all water valves that supply your fridge with water are fully open, and open and close the water saddle valve behind your fridge (if applicable). 1 – A home water filtration system can reduce the water pressure to your home including the fridge. Check the owners manual on your home water filter system for more info. 2 – A Reverse Osmosis Water System can have clogged filters. 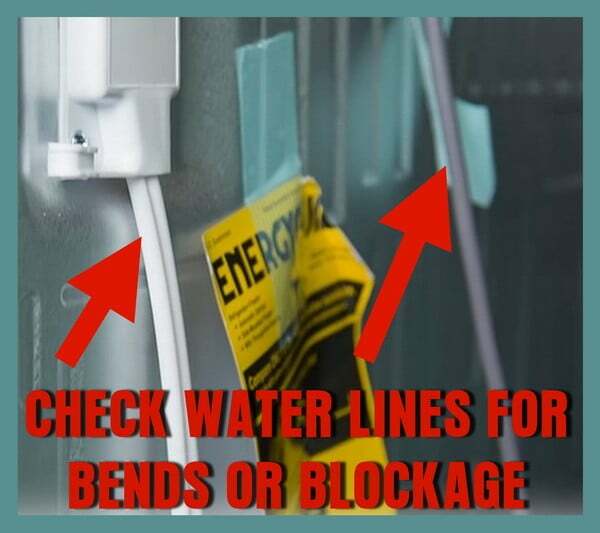 If your R/O water system has a water line connected to your refrigerator, be sure the R/O is working properly an has new filters installed. 3 – A Faulty Refrigerator Water Inlet Valve Solenoid can be causing your slow or no water dispensing issues. Refer to your owners manual for more info. Note: When you replace the water filter on your refrigerator, there may be air trapped in the lines and filter that need to be purged. After replacing your water filter, run the water dispenser for 30 seconds to remove air and any debris from the new filter. 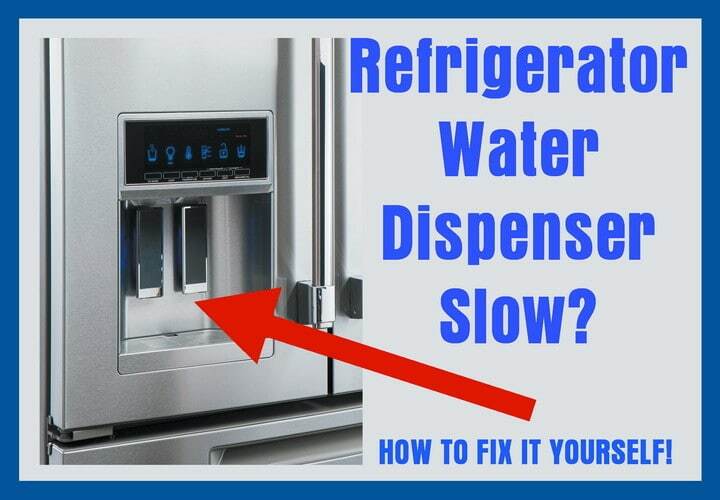 If you still need help, assistance, or answers to fix your Refrigerator Water Dispenser Slow problem, ask the experts on our Appliance Repair Help page for free answers to fix your broken appliance! If you know of other reasons a refrigerator water dispenser is slow to dispense water or ice cubes are not fully producing, please leave a tip or comment below to assist others with the same issue.